If you’re looking for family fun or a way to experience fall festivities this weekend, wind your way through the corn maze or pick your own pumpkin off the vine at Lone Star Family Farm. 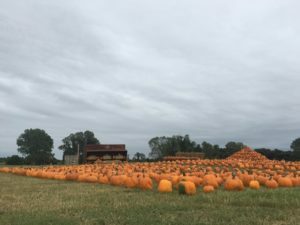 The farm is open on weekends through Nov. 19 and is located off U.S. Highway 67 west of Stephenville. Josh and Ashley Ritchey grew their first pick-your-own pumpkin patch in 2011 in Lubbock, then moved to Stephenville and bought the farm in 2013. In 2014, they added a six-acre corn maze. 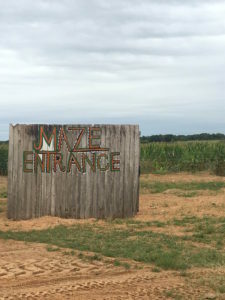 This year the maze sponsors NBC Channel 5. The theme, “Texas Connects Us,” features the sponsor’s logo, as well as different weather conditions. It’s not all just about having fun at Lone Star Family Farm, though. Its mission is spreading agricultural education through recreation. Part of the educational aspect at the farm is their cotton crop, located in their educational farming area at the end of the corn maze. Visitors have the chance to get a hands-on experience with a real cotton crop, being able to look at, touch and learn about the different uses of cotton. Josh, who taught agricultural-related classes at Texas Tech University in Lubbock, said he likes teaching the kids. He added that he doesn’t want to lecture visitors, but just wants people to be around agriculture to see the work that goes into growing crops. “I enjoy helping people learn about this stuff,” he said. 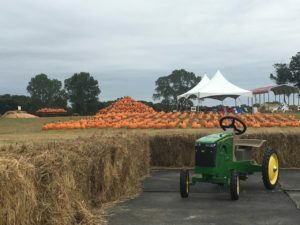 Other attractions visitors can enjoy at the farm include a hay bale maze, hay bale pyramid, giant slides, corn and sand pits, roping dummies, stick horses, farm animals, hayrides, fall décor and many photo opportunities. This year the farm added a cow train, which is a unique way to get around and see the entire farm. Lone Star Family Farm also provides activities for groups of 15 or more. The farm offers campfire packages, including one that includes s’mores ingredients to enjoy around the campfire. Pre-scheduled group visits and parties are also available during regular hours as well as during the week by using an online reservation request form at www.lonestarfamilyfarm.com or by calling 682-498-3276. General admission ticket prices are $10 per person (plus tax) for youth and adults. Children 2 years of age and under are free with a paying adult. Some activities around the farm require an additional fee. Lone Star Family Farm is located at 4199 U.S. Highway 67. It’s open in October on Fridays from 4 to 10:30 p.m., Saturdays from 10:30 a.m. to 10:30 p.m. and Sunday from 1:30 to 7:30 p.m. In November the farm will be open on Saturdays only from 10:30 a.m. to 6 p.m.